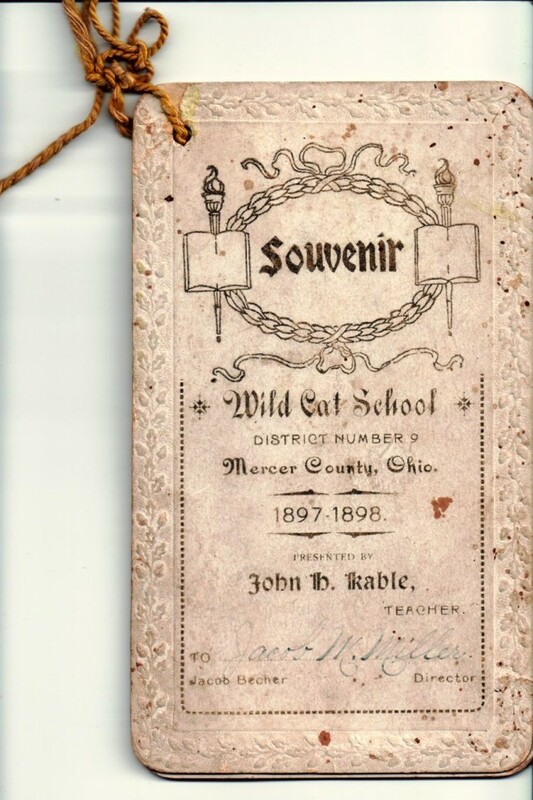 Wild Cat School Souvenir Booklet, Mercer County, Ohio, 1897-1898. Among some old items from the Chattanooga area that my dad gave me is the School Souvenir Booklet of Jacob M. Miller. The booklet was given to Jacob during the 1897-1898 school year by his teacher, John H. Kable. Wild Cat School was located on the southeast corner of State Routes 49 and 707, a mile north of Chattanooga. 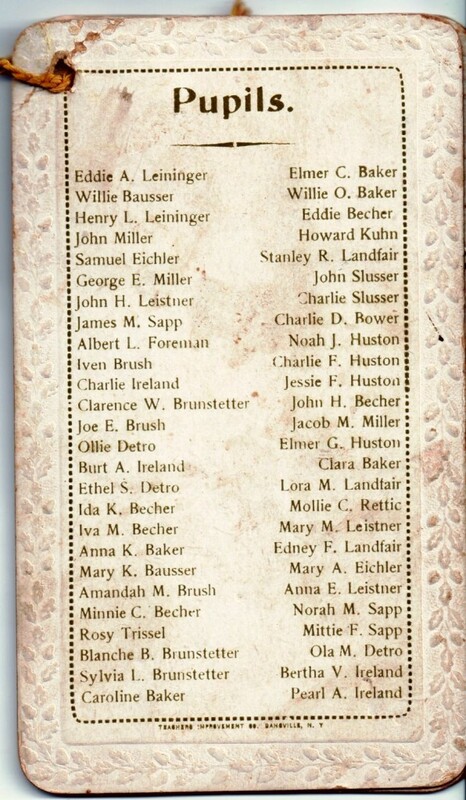 Jacob Miller Jr. (1885-1913) was my granduncle, the son of Jacob and Christina (Rueck) Miller. Jacob’s booklet consists of three embossed 3 x 5” cards tied together by a string in the upper left. I have seen similar School Souvenir Booklets on the Internet but most are from the early 1900s. This is one of the oldest I have seen and it is in remarkably good condition. Rem. II. You shall at all times apply yourself to you studies with the best of your powers and of mind and body. Rem. III. Be ready at the beginning of each school term to go to the beginning, attend each day, and be at its closing session. Rem. IV. Obey your teacher in beginning the study of different subjects, and as soon as possible study all the common school studies, and any other you desire or have time for. Rev. V. Be careful in the use of your language in the recitation. Rem. VI. Be kind to your schoolmates wherever you see them, and remember that good order is loved by all. Rev. VII. Attend as many Educational Meetings or Societies as you may have opportunity, and use good manners at these places. Always be ready to take part in such meetings. Rem. VIII. Urge your parents to visit your school and teacher. Rem. IX. Be sure to use and treat all teachers as good as you have treated me, whose name is annexed hereto, for nothing injures you except your own acts. Rem. X. Always try to do right, for to do wrong is going into crime and its reward is punishment. 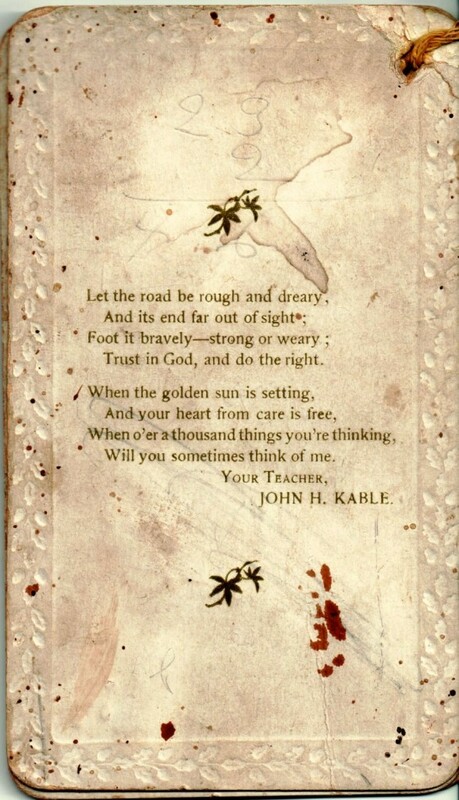 JOHN H. KABLE, Teacher. Wild Cat Souvenir Booklet, Card 2. Eddie A. Leininger, Willie Bausser, Henry L. Leininger, John Miller, Samuel Eichler, George E. Miller, John H. Leistner, James M. Sapp, Albert L. Foreman, Iven Brush, Charlie Ireland, Clarence W. Brunstetter, Joe E. Brush, Ollie Detro, Burt A. Ireland, Ethel S. Detro, Ida K. Becher, Iva M. Becher, Anna K. Baker, Mary K. Bausser, Amandah M. Brush, Minnie C. Becher, Rosy Trissel, Blanche B. Brunstetter, Sylvia L. Brunstetter, Caroline Baker. Elmer C. Baker, Willie O. Baker, Eddie Becher, Howard Kuhn, Stanley R. Landfair, John Slusser, Charlie Slusser, Charlie D. Bower, Noah J. Huston, Charlie F. Huston, Jessie F. Huston, John H. Becher, Jacob M. Miller, Elmer G. Huston, Clara Baker, Lora M. Landfair, Mollie C. Rettic, Mary M. Leistner, Edney F. Landfair, Mary A. Eichler, Anna E. Leistner, Norah M. Sapp, Mittie F. Sapp, Ola M. Detro, Bertha, V. Ireland, Pearl A. Ireland. Wild Cat Souvenir Booklet, Card 3. Trust in God, and do the right. Will you sometimes think of me. Your Teacher, John H. Kable. Wild Cat Souvenir Booklet, back of Card 3. The teacher gave some good advice to his students as well as letting them know what he expected from them. Jacob would have been about 12 years old when this book was given to him. His brother John, also one of the students, would have been about 8 years old. 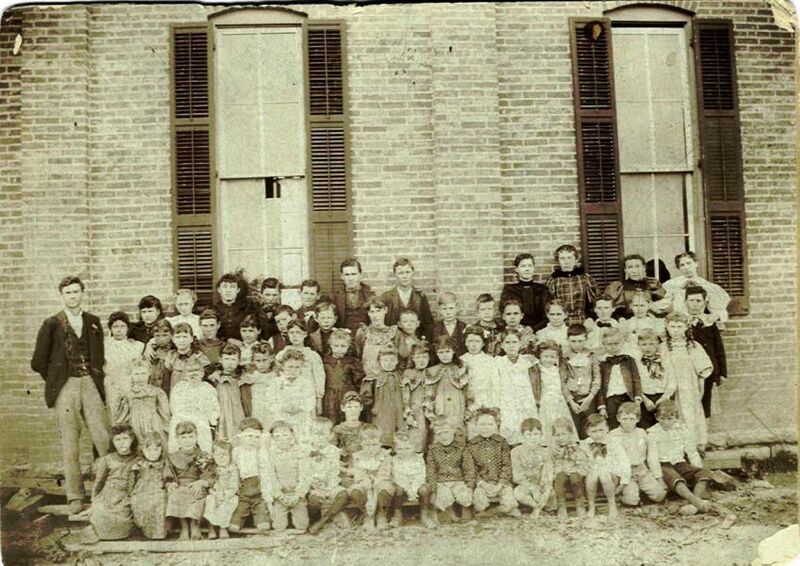 Below is an undated photo of Wildcat School showing 61 students and their teacher. It is one of the few photos that I have that shows the school. Wild Cat School, Mercer County, Ohio. Undated photo. 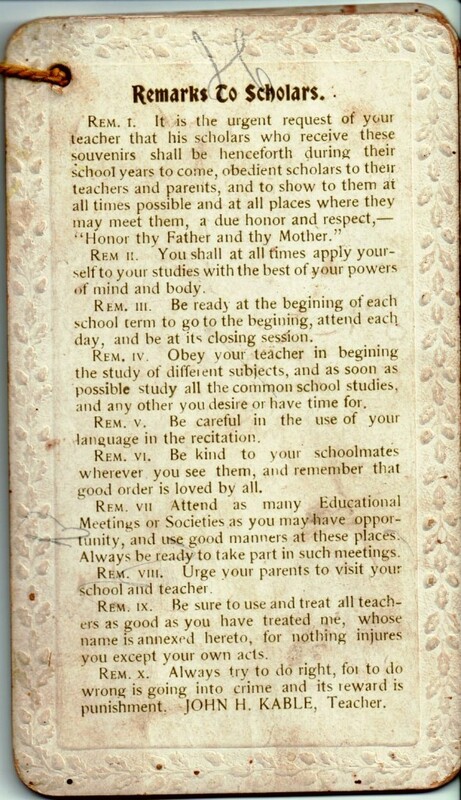 Perhaps this small document with its bold proclamation of virtures says something more about our present crisis in the schools and society than it does about the “good old days.” Just how politically correct would such a teaching tool be today? “Nothing injures you except you own acts.” In short, we have created our own problems by the very soft approach that we use to define good and bad. If it is popular, it can’t be bad, can it? I agree. The teacher made it clear that one is responsible for his/her own actions and that punishment would be the result of doing wrong. Indeed a further difference is clear from even a cursory reading: an education was a privelege. Respect the opportunity and the people or don’t come. Very different from our modern attitude that everyone must go and the system then must accomodate those with no interest in being there. A devastating mistake to the quality of the education offered to those who really want it as the system is bogged down babysitting those who don’t. Karen, Do you know if the teacher in the wildcat school photo (which shows the teacher and students in front of the school) is in-fact the same John Kable as is referenced on the school souveir cards? If so that would be a great find, as I have no pictures of John. Thanks! No, I’m sorry. I do not know. It is an undated photo. It would be great if someone could date the photo or identify one of the children. If anyone ever does identify or date the photo I will be sure to post it. I have the exact same photo at home of the Wild Cat School and its pupils. In fact, my great grandmother Christena Rosena Byer Gappa is standing in the back row on the right. She is the tallest girl there wearing a plaid dress. She was probably the tallest girl in most of her classes as she grew to 6 feet in height if not a little taller. Unfortunately that tall gene missed me as I stand 5’10” on a good day. 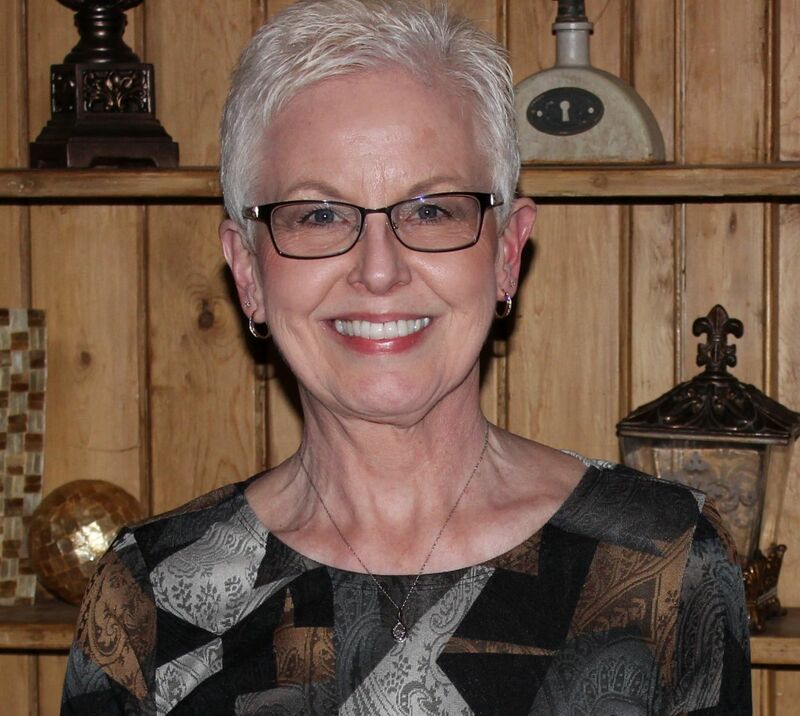 Christena did have a grandchild reach 6’11” in Jerry Johnson–former center for Purdue’s 1969 run to the NCAA’s title basketball game. Other cousins have reached 6’5″ but somehow I was cheated. I would think Christena’s younger brother by 2 years Jacob Frederick Byer is in the photo, too, but I just haven’t figured out which one he is yet. Thanks for the additional information about the school photo! I also think the photo dates from the 1897-1899 era as my great grandmother moved from Mercer County, Ohio, to Knox, Starke County, Indiana, in either 1898 or 1899. She was born in 1883 so she is between 14 and 16 in the picture. Now that I really think about the photo and have done some research, I think it comes from the 1897-1898 school year. I found a source that states my great grandmother’s family moved to Knox in 1898 so maybe that’s why she’s in the photo but then not listed as a student in Mr. Kable’s program–she was there long enough to be in the school photo but gone by the time the end-of-the-year ceremony took place. Anyone else with any other theories? By the way, was that a one-room school house? All those students of various ages for just one teacher? Yes, as I understand it all of the children, of all ages, were in the same room with only one teacher. I have heard that some of the older students helped the younger ones. From the placement you describe for the school, it sat directly where your parents’ home now sits, correct? Any idea when it was demolished? Or how? Many of those old schools still exist in the area, though the one on up 49 to the north was destroyed by lightening and removed a few years ago, ok, more than a few years, but not too long back. After it lay in ruin for a few years, someone did finally clear all the bricks. I think it was where my father attended, but not entirely sure. Wild Cat School once stood where my parents’ home is now. I do not know when they tore it down, but my dad went to Willshire to school. One or two of my aunts went to Wild Cat School. Had to go back and check your memorial to your Father. I had not connected with the fact that he was so much younger than my dad. Guess it all adds up. Still recall seeing your Father up close for the first time maybe 10 years ago and being flabbergasted at how he looked, sounded and even smoked like my dad had when he was alive. Guess I assumed that because you and I were so close in age, so were our parents, but clearly not so. Which school did your Dad attend?